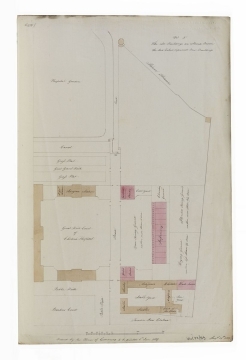 Drawings 15 and 16 appear in printed form in Papers, presented to the House of Commons, relating to the Building of a New Infirmary, and the Leasing of Ground at Chelsea Hospital, alongside a paper by G. Saunders. 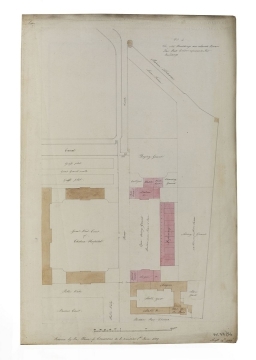 This suggests the replacement of the buildings opposite Wren's West Court with the new Infirmary, as the writer believed an Infirmary facing the river was not beneficial to the health of patients. Saunders writes (on 31 May 1809) that 'all the buildings round this court are of an inferior kind' and 'On that supposition, I recommend that the whole of the side of the quadrangle where the surgeon's residence now is, should be devoted to the infirmary'. The plan shown in drawing 15 accompanies this suggestion. The plan shown in drawing 16, however, is slightly altered and supports a revised paper submitted by Saunders on 5 June 1809, suggests the conversion of one of the Wren wings into accomodation for the Surgeon and Matron, which would reduce the length of the detached wings on the Infirmary side and allows for a coal yard in between. George Saunders (1762-1839) was an architect listed in H.Colvin, Biographical dictionary of British architects. Saunders is also mentioned in connection with Soane in A. T. Bolton, The Works of Sir John Soane, 1924, in which there is a footnote (p. 151) - 'But dining with my friend Saunders this day, both our indignations were roused ...' It is possible that Soane put Saunders up to writing this paper or Saunders may have submitted his suggestions independently of Soane. C.G.T. Dean states that George Saunders was 'an architect whose advice was also sought, [who] regarded Walpole House as quite unsuitable, and endorsed Soane's opinion that the proposed infirmary should be built on the best available site, which was that intended for Colonel Gordon's house, overlooking the river'. His proposal in plans 15 and 16 faces the west court however. This would have meant further demolition of existing Wren buildings, to which Soane objected, stating that 'to destroy any more of the original buildings must be matter of very serious regret'.